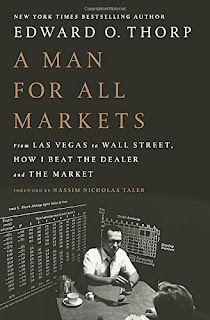 A further look today at a volume I mentioned a short while back, “A Man For All Markets” by (and about) Edward O. Thorp. 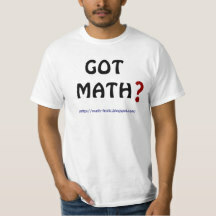 It may not be thought of as a popular math read, but I think there is just enough math in it to qualify. For any who don’t know, Ed Thorp is a trained mathematician, who taught for awhile, before following his heart and delving into games/gambling/Las Vegas and later the stock market and Wall Street… with, one should quickly add, remarkable success! This book tells the autobiographical story of his incredible life. Thorp started by figuring out (mathematically) winning strategies for gambling endeavors like blackjack, roulette, and baccarat before moving on to run very successful mutual/hedge funds on Wall St. If you have no interest in the financial markets than this bio may not grab you, but as most people do have some interest, it contains pages that will draw in most readers. His many life accomplishments make it seem easy to just apply basic logic to various situations, including the stock market, and succeed, yet most people consistently fail at such efforts. The book reminds me slightly of Siobhan Roberts’ account of John Conway, "Genius At Play," from 2015 (my favorite volume of that year), but it is not nearly as fun a read. The similarity comes from two iconoclastic and brilliant figures telling the anecdotes of their lives. But Roberts’ lively, engaging writing and Conway’s antics lifts her excellent portrayal to another level. In comparison, much of Thorp’s volume is duller, the writing often more stilted or bland, but still his anecdotes are fascinating enough to pull you in. 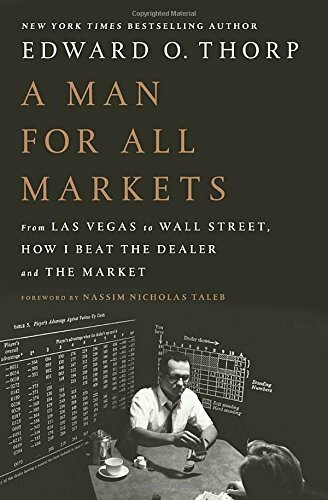 Stories around his gambling pursuits, the rise and fall of his own hedge fund (Princeton Newport Partners), the Black-Scholes options-pricing formula, his take on the Bernie Madoff affair, his contrarian analysis of the traditional “Efficient Market Hypothesis,” and take on the 2008-9 market crash, are among many interesting passages sometimes couched within more stodgy, matter-of-fact material. I especially enjoyed the last few chapters and "thoughts." One thing I also liked about the volume is the way it portrays an individual who relied heavily on “intuition” to launch most of his successful ventures, before his technical brilliance fleshed out all the details required. 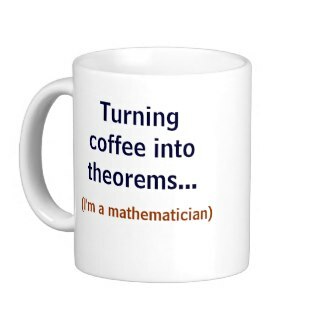 The central importance of intuition, passion, and curiosity sometimes gets lost in the focus on logical deduction among mathematicians, and Thorp implies that he succeeded where others failed because of his greater intuitive grasp of situations more so than keener logic. I do recommend the book, especially to anyone with an interest in the many machinations of Wall Street, but it’s not the most riveting read around, despite many entertaining parts. Week #17 of Trump’s looting-and-dismantling of America…. 2) Pat Ballew has amassed a lot of great historical material with his “On This Day In Math” blog and Twitter feed. I suggested earlier this week that with some organizing effort the material could probably make a great calendar or book for math fans.